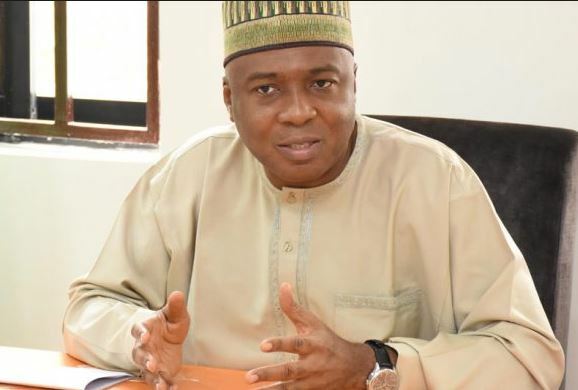 President of the Senate, Dr Bukola Saraki, has criticized the approval given by President Muhammadu Buhari for the withdrawal of $1billion for the purchase of security equipment. Saraki spoke at a retreat on “Strengthening Executive -Legislature Relations” organised by the Senate Press Corps held in Jos, Plateau state on Saturday. He also expressed regret over the delayed passage of the 2018 budget, saying there must be collaboration and engagement between the Executive and the Legislature. The Senate President said: ”So long as the process for the passage of the budget is not based on participation, engagement and collaboration, much will not be realised. “The Executive and the legislature are partners. We need each other: the constitution does not allow one arm to work alone, that is why there is checks and balance. “There is no security architecture of this country that can work without a strong synergy between the executive and the legislature. “When you see certain agencies, who by their actions and utterances frustrate the relationship between the two arms, you begin to wonder. “What do we need to do? Do the police need more funding or more powers? Do they need new legislations to strengthen them. These are the issues where the executive and the legislature must work together. “Just few days ago, there was the issue of providing funding for the purchase of security equipments. In a good environment, such an issue needed to have been discussed with lawmakers. ”Already, some senators are angry. They said they were not consulted by the executive before such a decision was taken. These are the issues we are talking about. “I needed to be here to speak on these issues. It is not just about today. Posterity will be here to judge us that what I am saying is true. If we do not change the way we behave, we will remain like this for many years to come,” he said. According to the Senate President, for democracy to be strengthened, the priority of everybody should be to strengthen the legislature. “If you do not defend the legislature, there is no way that our democracy will be strengthened because government is not built on individuals. It is built on institutions. “That is why in developed countries, governments can change, but it does not affect the stability of their democracy because their institutions are strong. “We decided to run a presidential system of government. By its nature of checks and balances, there are bound to be frictions. The question now is how healthy is that friction,” he said.